We use the latest technology, including WaterLase & BioLase lasers to offer a comfortable, pain-free experience for all our patients. The WaterLase laser is a high-tech tool that allows us to perform many dental procedures with virtually no pain. We almost exclusively use the WaterLase laser for a wide variety of procedures, including preparing cavities for fillings, root canals and most surgeries. 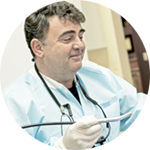 Unlike standard dental drills, the WaterLase laser is very precise and accurate, resulting in very little pain. Often, the process is so gentle, anesthesia isn’t necessary! In addition to the WaterLase laser, we utilize a warm laser technology from BioLase, which we use for treatments such as teeth whitening and pain therapy. Their are distinct advantages to using a laser in these procedures, as compared to standard treatment methods. For instance, with our BioLase lasers, a teeth whitening treatment that typically takes one hour can be completed in only twenty minutes, which is faster than any other in-office whitening system.